Introducing the New York Legend bike lock…. Kryptonite had this monstrous chain lock on display at Interbike last September. I nearly herniated myself when I lifted this beast from the display. 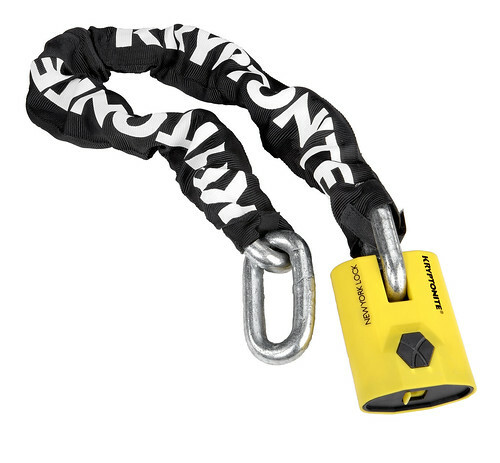 Kryptonite says the 3T tempered steel 15 mm rounded links and its provided Kryptonite New York Padlock provides “extreme security for high crime areas.” Chain is encased in a nylon sleeve to protect paint from scratches and allows for tight coiling during storage. The New York Padlock is armor-plated with shrouded 16mm thick shackle and features a hardened double deadbolt design. According to Kryptonite, the New York Legend resists attacks from bolt cutters, saws, chisels, files and hammers longer than any other Kryptonite chain lock. 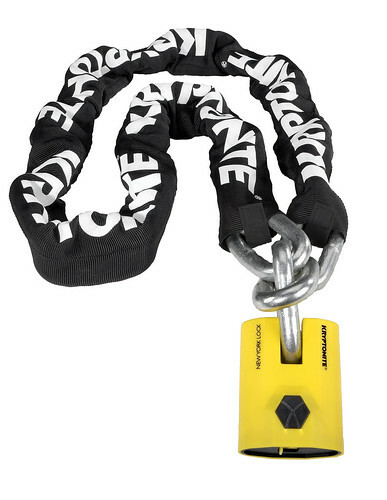 Other thoughtful design elements includes a pass through end link to resist prying attacks on the padlock shackle, a pick and drill resistant cylinder on the padlock, and hook-and-loop retention strips on the nylon sleeve so it doesn’t slide around and bunch up at one end of the chain. The three foot chain weighs about 10 pounds; the five foot chain comes in at a hefty 16 pounds. The folks at Kryptonite envision this as “a destination security item” rather than something you tote along everywhere you go. The New York Legend, which will be available in the USA and Canada by March 2009, includes up to $4,500 in bike theft insurance, Kryptonite’s highest. MSRP is $159.95 for the three foot lock; $209.95 for the five foot lock. Not a bad idea. The police let an Igor Kenk run a crack/bike ring in my town (Toronto) for twenty years, until he was stupid enough to jack a bike in front of two cops. All the cyclists in town knew his game; hell, he had a storefront on a major shopping avenue. I don’t think I even want to be in a neighborhood that requires one of these, much less stay there long enough to chain up my bike. No kidding. Hell, the bike lock is worth more than the bike that shouldn’t be locked up in the neighborhood! LJ, there’s not necessarily a link between bike theft rates and general public safety. San Francisco and New York are both in the top 10 safest large cities in the USA, but bike theft is a very real problem in both of those cities. I got my onGuard for $80ish dollars. Im estimating is just as heavy, but has the tiny u-lock at the end. Didnt register it for the insurance, however I try not to lock my baby outside whenever possible, but if I must (which is very often…), I use that and it has always been there upon my return. If I ever must replace the lock, I will def. consider something like this. We sell this puppy in our bike shop, its crazy heavy, the most use it gets is for hazing purposes, the new kids have to wear it for their first day, its pretty rough considering it how much it weighs. I have the New York Noose from Kryptonite. My experience is the “theft insurance” is useless after you look at the fine print (original sales receipt or appraisal from bike shop, and have to send broken lock). My chain weighs 7lbs, I typically wear it like a sash, or twist it around my frame (careful not to cross any break or gear lines). I bike in downtown Philadelphia and knew it was worth the price and extra weight after I came out and saw marks in the finish from somebody who tried to cut it. If you bike in a big city, and have a bike worth more then $80 you have to at the very least get the New York Noose. My bike was stolen in 5 minutes while locked with a fancy Kryptonite lock. Kryptonite uses every loophole to avoid honoring its “insurance.” It’s worthless, just marketing hype. They lie and steal your $$. Buy elsewhere. I recently had my Bianchi Pista stolen while using a Krypto mini U. I Just bought this bad boy because I don’t want to take another chance. My Bike was stolen in the Yorkville area of Toronto which is very High end. It has nothing to do with neighborhoods, it’s about professionals that steal bikes and know they’re stuff.